In this illuminating talk Mark Major shows why, with urban lighting, often less is more. Mark Major is an architect and lighting designer and a Director of the award-winning international practice Speirs + Major. 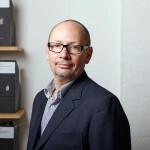 He has worked on a wide range of projects including lighting masterplans, public realm and building projects. He lectures around the world and contributes articles on lighting to various magazines. He co-authored the best-selling book &apos;Made of Light – The Art of Light and Architecture&apos;. He was created a Royal Designer for Industry in 2012.